The plot of ONCE UPON A TIME IN ANATOLIA concerns a murder, and the efforts of the confessed murderer to lead the authorities to the location where his victim is buried. To say that it is a crime film, however, would not be entirely accurate. The surface story is never less than compelling, but it's also a means to an end; a way for the film to get across its central theme that sometimes the truth can be more harmful than a lie. That theme is at the heart of the main storyline, in which a secret that would have been better left unspoken turns out to have indirectly precipitated the murder while also adding another layer of tragedy to the events. However, it is perhaps best illustrated in a subplot involving a tale one member of the search party, the prosecutor who will be trying the murder case, relates to the doctor who has been brought along to perform an autopsy on the victim. The story concerns a beautiful woman who accurately predicted that she would die within days of giving birth. The prosecutor believes it to be a mystery with no rational explanation. The doctor is skeptical and continues to probe for more details, eventually reaching a far different conclusion that is both more prosaic and painful. Kenan, the man who confesses to the murder, may also be lying about the degree of his involvement to protect his mentally challenged brother. This possibility is touched on only briefly, but if Kenan is lying then this is one lie, though not the only one, that is allowed to persist in the film. 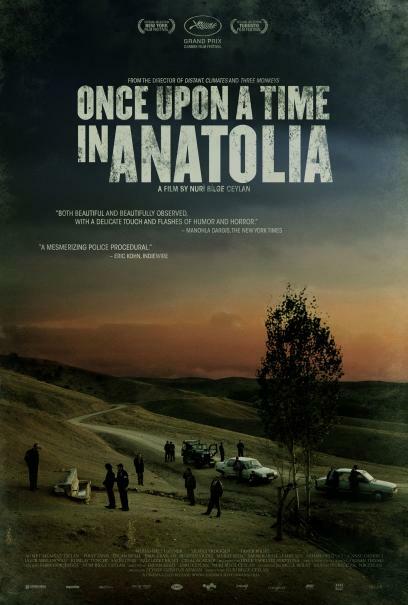 Director/co-writer Nuri Bilge Ceylan also spends a good bit of his film's running time creating a sense of place and imbuing it with a particular atmosphere. There are many long shots of the characters driving from one place to another looking for the body that drive home the repetitive blandness of the landscape. To pass the time, the characters engage in banal small talk dealing with subjects ranging from a kind of buffalo yoghurt so thick it has to be cut with a knife, to Turkey's aspirations of joining the European Union. Many characters also comment on how the region itself seems to breed violence and despair. The film is long and moves at a leisurely pace with little in the way of action and frequent detours that don't necessarily advance the plot which are nonetheless rewarding. All the questions one might have in the film are answered, but the answers are definitely not spoonfed to the viewer. This is a film that not only rewards but requires careful attention and a good bit of patience from its audience. 4 out of 4 stars. Unbelievably enjoyable portrait of deceptions of self and other. This compares with Bergman existential forays, and my therapist recommended it to me and my wife who thoroughly enjoyed it.